Candidates interested in full time PhD Program with Research Associateship are encouraged to apply. Note: Number of seats may vary based on vacant seats available with recognised PhD Supervisor (Guide) on date of admissions. Date of Entrance Test: 09th March 2019; 11.00 a. m. to 1.00 p.m. Candidates for admission to the PhD Program shall have a Master's degree or a professional degree declared equivalent to the Master’s degree by the corresponding statutory regulatory body, with at least 55% marks in aggregate or its equivalent grade 'B' in the UGC 7-point scale (or an equivalent grade in a point scale wherever grading system is followed) or an equivalent degree from a foreign educational Institution accredited by an Assessment and Accreditation Agency which is approved, recognized or authorized by an authority, established or incorporated under a law in its home country or any other statutory authority in that country for the purpose of assessing, accrediting or assuring quality and standards of educational institutions. Relaxation of 5% of marks, from 55% to 50%, or an equivalent relaxation of grade, may be allowed for those belonging to SC/ST/OBC (non-creamy layer)/Differently-Abled and other categories of candidates as per the decision of the Commission from time to time, or for those who had obtained their master’s degree prior to 19th September 1991. B. Tech/B.E./B.Sc. Engineering or equivalent having a minimum 60% marks (55% marks in case of SC/ST candidates) and having evidence of published research with a minimum FIVE years of professional experience after obtaining his/he Bachelor’s degree, the Director General on the recommendation of the Doctoral Committee may be considered for admission to the PhD Program. Part-I: It shall be of 25 marks of multiple choice questions and each question carries equal weightage. Part-II: It shall be of 25 marks with Five descriptive type of questions and each question carries equal weightage. M. Pharm Building, Ganpat University Mehsana - Gozaria Highway, Ganpat Vidyanagar - 384012, Gujarat, India. Convocation Fee - As applicable from time to time. 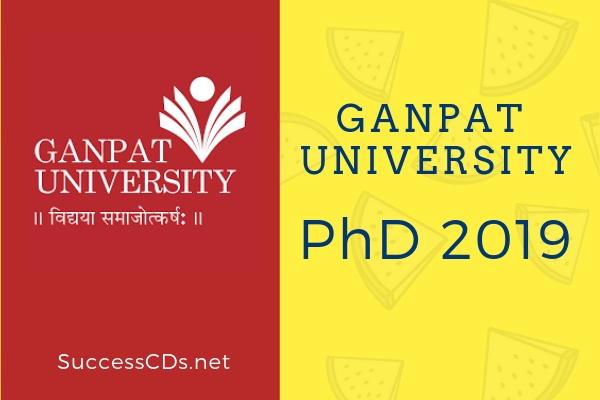 Eligibility Certificate Fee of Rs.500/- shall be paid by the candidate who has to obtain the Eligibility Certificate from Ganpat University, i.e. candidate who has obtained his/her Master’s Degree from other Universities. Applications are invited for admission in PhD Program. The interested candidate have to apply online at www.ganpatuniversity.ac.in. Enter the relevant correct data. Upload required copy of mark sheets/certificate (Marksheets of final semester of Undergraduate and Postgraduate Degree and Degree certificate of Post graduate Program). The duly filled Application form along with prescribed documents and evidence of online payment of Rs. 3000/- is to be sent to "The Registrar, Ganpat University, Ganpat Vidyanagar-384012, Mehsana Gozariya Highway. Dist.- Mehsana, Gujarat".